Oh, Kool-Aid, how the sons love you. How they will agonize over the packet selection at the grocery store, trying to find the perfect five or so for a $1, occasionally arguing amongst each other over whether they really want to waste one of their picks on plain, old orange. It’s always a bit of a bummer for them when they realize their packets have run out, and they’ve got to wait 2-3 more weeks for our monthly grocery trek to get anymore. Imagine their surprise when they saw me putting extra packets into the cart a few months ago. They were a bit surprised when I said we wouldn’t be drinking the grape or the cherry, but baking them instead. These were super easy to make, and the kids enjoyed the slightly sweet taste as the cookies melted in their mouths. The older sons even learned how to separate an egg, something I didn’t do for the first time until just a few years ago. Son # 4 even helped pipe them out onto a baking sheet. He was pretty proud of himself and his ability to get his hands ‘dirty’. I’ve seen these described before as easy peasy lemon squeezy and that’s the truth! 2. In a stand mixer, beat the eggs till they are frothy. Then add in the cream of tartar and continue to beat until soft peaks form. Then start beating in the sugar, 1 tablespoon at a time, until it is all dissolved and the peaks are stiff. Rub a little of the egg whites between your fingers to check for gritty sugar. The mixture should be smooth. Then beat in a teaspoon of the Kool-Aid liquid. 3. Put in a piping bag with a 1M tip and pipe onto a parchment covered baking sheet or silicone mat. Keep the cookies uniform so they will dry evenly. Bake for 45 minutes and then turn off the oven and leave the cookies in for another hour. They should be completely cool and release easily from the baking sheet. 4. Enjoy right away or store in an airtight container. Oh my those cookies are so pretty, I do love meringues. It has been many years since I have thought about kool aid. Only a tsp adds such vibrant color. The light floral colors remind me of Spring. 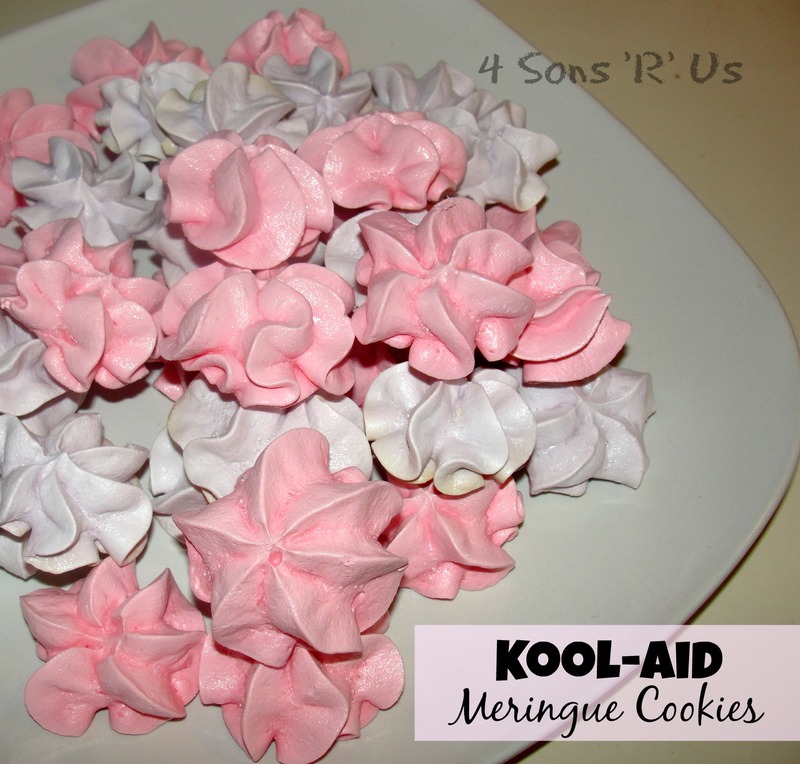 The sons remind me of Kool-Aid all. the. time. It gives them the perfect hint of sweetness! i love meringues! thanks for sharing! Well, this is just perfect party food! You can pop these sweet treats every time you walk around the table! I just love the summery colour and my brain is anticipating that wonderful crunch of meringue! So very yummy and thanks for bringing them to Fiesta Friday! What fun little cookies and pretty colors! Thanks so much for sharing this awesome recipe with Full Plate Thursday and come back soon!